Icon Audio releases Stereo 845 pure triode push-pull integrated valve amplifier | What Hi-Fi? Icon Audio has unveiled details of its Stereo 845 pure triode push-pull integrated valve amplifier. 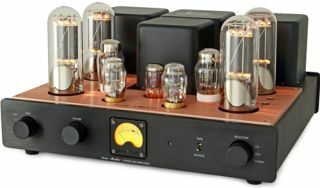 The Stereo 845 comprises four matched 845 valves, two 6SL7 first-stage valves, two 6SN7 output-driver valves and a GZ34 driver-stage rectifier. Icon Audio has included an 'easy-bias' meter, which allows users to manually calibrate the four 845 valves. These are capable of delivering a continuous output of 40W per channel. The amp has four line inputs and low distortion tertiary-wound output transformers, which are potted in an attempt to reduce noise. Icon Audio says the Stereo 845 can be used with any set of speakers, saying that it "offers a very unbiased interpretation of music in a way that only valves can do". It goes on to say that "like all 845 amplifiers, the Stereo 845 produces a full-bodied, full-range sound with powerful bass and lightning reflexes". The 845 valve is already used in Icon Audio's MB845 monoblocs. The company claims it is able to deliver "tremendous dynamics and powerul bass." David Shaw, founder of Icon Audio, commented on the fact the valves only deliver 40W, saying, "Forty watts is ample power to obtain sufficient volume in most situations." The Icon Audio Stereo 845 pure triode push-pull integrated amplifier is available now for £6000.